Recent research has identified yet another risk factor for gestational diabetes. But is this really worth considering if you're pregnant? 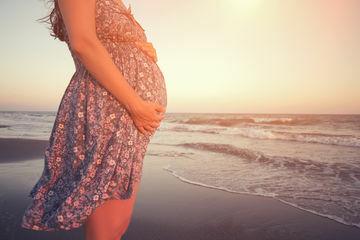 Well, this is something plenty of preggos won't want to hear: According to new research, gestational diabetes risk may increase if you're in your final month of pregnancy during the summer. According to the study—which was published in the Canadian Medical Association Journal—gestational diabetes appears to be more common among women who are nearing the end of pregnancy during the summer as compared to those who give birth during colder months. Researchers observed 400,000 pregnant Canadian women over a 12-year period to come to this finding: About 5 percent of the women exposed to very cold temperatures at the end of pregnancy had gestational diabetes, while around 8 percent of those exposed to hot temperatures had the condition. Now, gestational diabetes has several risk factors—for example, women who gain excessive weight during the first trimester are at increased risk, as are women with Korean and Filipino heritage. That's why it's worth noting that this particular study found the seasonal link even when they compared two pregnancies in the same woman. This finding leads the researchers to believe that summer pregnancies may be riskier than winter pregnancies. But let's not forget that previous research indicates that babies born in the fall and winter have their own set of risks—in light of that, is it really worth worrying about your gestational diabetes risk if you're set to deliver this summer? Heather Bartos, M.D., an OB/GYN at Be Women's Health and Wellness Center, weighed in on the study's findings. "A woman's chances of gestational diabetes is increased by many things, including obesity, family history, age, number of babies she's carrying, etc. I doubt the season will impact the risk that greatly on a woman who has no risk factors. And since most Americans are pre-diabetic, nearly everyone has a risk factor," Dr. Bartos told Fit Pregnancy. "Also, remember pregnancy lasts for 40 weeks, which is most of a year. So unless a woman lives in the northern Yukon, chances are she'll experience some hot weather during her pregnancy." While the study found the link among women who were in their final month of pregnancy, Dr. Bartos makes an important point: There are several factors that will influence your odds of developing gestational diabetes, and if you'll be in your final month of pregnancy during the summer, we'd urge you to simply do what you can to bring down your risk. When it comes right down to it, that involves maintaining the healthiest lifestyle possible.